I signed up for my Blog & joined Blogging in August 2012. I joined IndiBlogger and other Blogging sites like BlogAdda 11 months ago in July 2013. My Blog had less than 10 Posts, less than 10 Followers, less than 10 Comments & less than 1000 Page-Views. Just yesterday it has clocked 1,00,000 Page-Views! I feel blessed by interacting with IndiBloggers from across the world. The CONTEST JUNKIE in me is happy! In the past 11 months, I have learnt about Blogging. Though I had a Blog for almost a year before joining IB, I wasn’t aware & had never focused on my Blog’s technicalities. I learnt about TIME factor in Blogging. Based on experienced Bloggers' advice, I publish & post my Blog's Contest-entries close to the Contest-deadline. After an IB Forum discussion for one Contest, I researched & found that my Blog was following ‘Pacific Standard Time’ & not Indian Standard Time (IST). I was so ignorant! As my Blog followed "Pacific Standard Time", my Blog's Time was 13 & half hours behind IST. So 10:42 (AM) 21st November in a Post on my Blog actually meant - 00:12 AM 22nd November. Though I had first published my Post in my Blog at 00:12 AM & submitted it for the IB Contest, I now understood why my Blog’s posting time & comment-time was different than the India time! Later, I checked out my "Post Settings" and made the change in the TIME that my Blog follows! Presently my Blog has IST. After joining IB, I have focused a major portion of my TIME on my Blog. I have made major sacrifices and worked very hard for my Posts. I have also been Cinderella many times where I have had to stick to the deadline- Before 12 AM, Midnight! I acknowledge that there are many creative brains that share the same ideas and beliefs as me & think and write the way I do. Many times I have read posts on IndiVine that have dealt with ideas/topics that I have been planning to write! They had said it exactly the same way I wanted to say! I have got plenty of such ‘MY-KIND-OF-A-POST’ opportunities! In Contest Posts, I found some IndiBloggers had the same Title of their Post as I had, while others had some points or similar images in common with mine. Great minds think alike! To challenge myself to think different and to accept results. Though my great thought & effort for my Contest Posts has won some contests, yet I have not won even a Consolation prize in many – some of which are still amongst the most Popular Posts of my Blog! I realize that what I consider ‘Prize-winning Posts’ may not be as per the Judges’ perspective. For a writer, readers and their views are important. Positive feedback and compliments are inspiring. Last week I was thrilled to find my Blog amongst the Top Indian Blogs of 2013-14! My Blogging story would have been different without IndiBlogger. I want to thank the kind, helpful & supportive IndiBloggers Community. 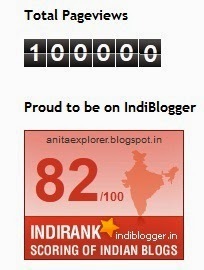 Thanks a lot, IndiBlogger & IndiBloggers! Thanks Ankur :) Congrats to you too! 1 Lakh is special! You do have a great mind, and great thoughts too.. Cheers! Hey, just saw you in the Femina coverpage below! You look lovely! You too keep smiling! Cheers! Wow! First, congratulations! You deserve an award like this! Second, really good to read your perspective. I am just 4 months old on Indiblogger and love the fact that there are so many like minded people around. I am still learning and I am sure Indiblogger is the right place to be on! Very nicely expressed! Great words, Shruthi! Thanks for sharing. True, IB helps in promoting our blog to a great extent. Kudos to IB. And congrats to you for touching the magical figure. All the best for the times ahead. Congratulations! Keep up the good work going.. Thanks for the appreciation & support, Rutavi. Thanks Arti for your motivating words & wishes! The pleasure is mine that I found wonderful friends like you in this IB journey. Thanks a lot, Sonia :) Welcome to my Blog! See Shruthi! Exactly my point! Great that you have updated the right time now! Awesome and congratulations! Loved reading your journey of blogging :) Keep going I say! Thank you so much, Bikram. Mine follows Pacific Standard Time too!! Thanks for pointing it out yo me!! Way to go Anita!! Congrats for the milestone Anita! It happens with me also that I am planning to write something and come to know that someone has written on that idea. Nice to know your journey. Vow, Vow, Vow! Amazing achievement Anita. Congrats again for reaching the milestone and keep rocking. Imagine how wonderful it'll be for India if we all get inspired & continue inspiring & learning & growing! Yes it is true that our blog gets traffic just because of Indiblogger.in. Well it is amazing to know that you have not won any prize contest but don't worry, you will bag a bigger prize someday. Keep blogging and Congratulations on earning so many page views. Drumrolls for you girl!! my hearty congratulations!! Thanks Anita for sharing your experiences. My pleasure :) Thanks for visiting my Blog. Congratulations for what you have acquired and hearty wishes for many many more to this list. I can see you are loving this journey. Readers and commenters are our best friends, critiques and solace. I love how you have jotted down nicely the "I Learnt" part....Bloggers are like minded in many ways.....What we all try to do is put the old message in a new bottle...and most of all learn to accept results.....inspire and get inspired....BTW, I live in the Pacific Time Zone, so no matter what time zone you live you say it's better to have it set into IST? I agree with all the lovely words you have shared here! No, I feel it is better to set the time as per the zone we are living. But, setting it to IST makes sense if you take part in many contests... The time of submission of your entry vis-a-vis the contest-deadline is then easy to see/prove! I mentioned that Time-factor incident as I learnt from a co-Blogger that it is "unethical" to have Pacific Time while I am staying in India! But, the Blogger wasn't aware that I had absolutely NO CLUE about the timing, before I was informed! Thanks Suvin! Best wishes to you too! This digital space is such a wonderful place to be! Kudos to you on your achievements. Firstly congrats for reaching getting lots of visitors by using indiblogger. and i also hope that the indiblogger works same for me as it worked for you. Inspired with this post.. It's time to explore new things in blogging.. I recently published Instant Audio Blogging Guide for Beginners..!! Indiblogger is an awesome place to find thousands of blogger from various parts of our country and in every category. This is a great post. Love to see you dropping by at our blog and leaving a comment on our most recent post. Joined the blogging community a few months back.So inspiring to read about your blogging journey! Congratulations! Out of the few bloggers I knew, I came across you through Indiblogger. So happy to hear good news of your milestones. Your writings have always helped. Btw you have been missing from action from my site. Would love to know your feedback.